Food security is a major issue in the present global scenario, and especially so due to the increasing population day by day. Numerous research studies have discovered that the current food production volume needs to be doubled in order to suffice for the needs of the current burgeoning population. Furthermore, owing to the fact that natural resources such as land, water and labor are limited, agricultural productivity needs to be compounded to feed the masses. Agriculture, being one of the most significant economic activities of a country, has gradually evolved from manual occupation to a highly mechanized practice in every aspect, including the data management practises. Reducing the technologies involved and the ease of their integration with the other devices is important to obtain a viable IoT system. Owing to the increasing emphasis on food security, growing adoption of ICT in agriculture, need of data management in agriculture, and growing popularity of UAVs & drones and precision agriculture, the IoT in agriculture market is expected to grow at a CAGR of over 16% in terms of market value through 2016 to 2022. The report is a compilation of the different systems, components, and applications of global IoT in agriculture market, including market breakdown by the application type, system type, and different geographical areas. Herein the revenue generated from each application type, namely: yield monitoring, variable rate application, filed mapping, soil monitoring, crop scouting, precision irrigation, and livestock management; and system component type, namely: tracking & positioning systems (GPS Devices, Radio Frequency Indentification (RFID)), monitoring & detection systems (sensors, UAVs/ drones, autonomous vehicles & tractors), telematics systems (network communication technologies & standards & protocols), and cloud computing devices is tracked to calculate the overall market size. 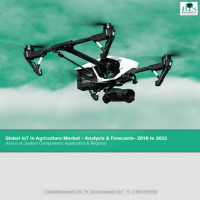 While highlighting the key driving and restraining forces for this market, the report also provides a detailed summary of the IoT in agriculture market. It also includes the key participants involved in the industry at the relevant sections. • What are the different factors driving the market and how will the impact of those drivers change through the forecast period? • What are the major factors challenging the growth of global IoT in agriculture market and how can they be addressed throughout the forecast period? • How will the market players leverage on key developments such as acquisitions, partnerships, and product launches among others? • Which region will lead the global IoT in agriculture market by the end of the forecast period? • How much is the revenue generated by the key system components across different geographies? • What are the prevalent application types and what is the market size for each of them? • What are the prevalent systems and the components used in these systems and what is the market size for each of them? • How will the overall competitive rivalry in the market evolve through the forecast period? The report puts special emphasis on the market share of the system types in different geographies in IoT in agriculture market, owing to the increasing adoption of IoT technologies and techniques in agricultural activities. In spite of this, due to the lack of awareness in emerging economies, requirement of huge capital investment, lack of infrastructure and government support, a majority of potential new entrants resist from adopting IoT in agriculture and related technologies. The report further includes a thorough analysis of the impact of the five major forces to understand the overall attractiveness of the industry. This segment also focuses on key restraints and government framework regulating the IoT in agriculture market. The competitive landscape segment provides a holistic view of the key strategies & developmental activities of the recent years. The most often used strategy for developing a better hold on to the market has been through product launches, followed by business expansion strategies. Moreover, the company profile section highlights significant information about the key companies involved along with their financial positions and proper analysis of each company’s strengths, weaknesses, opportunities and threats. Further, the report includes a comprehensive analysis of the geographical split into North America, Europe, Asia-Pacific (APAC), and Rest of the World (R.O.W.). Each geographical region analysis details the individual push and pull forces in addition to the key players from that particular region. The prominent players operating in the global IoT in agriculture market are AGCO Corporation, CNH Industrial, John Deere & Company, Lindsay Corporation, Raven Industries, and Trimble Navigation among others. 8.15 SST Development Group Inc.
Food security is a major issue in the present global scenario, and especially so due to the increasing population day by day. Numerous research studies have discovered that the current food production volume needs to be doubled in order to suffice for the needs of the current burgeoning population. Furthermore, owing to the fact that natural resources such as land, water and labor are limited, agricultural productivity needs to be compounded to feed the masses. Adoption of automation and mechatronics, especially IoT technologies in farming operations is a colossal step towards contributing in ensuring production efficiency and sustainability. The IoT technologies have largely transformed the agriculture sector by providing adequate support systems, backed by real time data gathered by utilizing a number of modern technologies, and by maximizing the quality and quantity of agricultural produce along with the financial returns. IoT in agriculture is a system that connects different components and allows the user to have a multifaceted view of his farming operations and also assists in decision making. In other words, the major IoT technologies actively assist in collecting data regarding crop and soil behavior, animal/ cattle conditions & their locations, agricultural machines, and inventory status, among others, with the combination of different technologies in one single system such as sensors, cloud computing, RFID tags, and data management software among others. The IoT in agriculture market is a combination of complex components, technologies and systems. Increasing emphasis on food security, growing adoption of ICT in agriculture, adoption of UAVs/ drones in agriculture applications, growing popularity of precision agriculture, and need for data management in agriculture are some of the factors responsible for the growth of this market. However, the market consists of certain challenges which are inhibiting the overall growth for the market, such as huge capital investment, lack of infrastructure, lack of awareness in emerging economies, and lack of government support. The concept of IoT in agriculture market revolves around the types of applications and systems used for these applications. Yield monitoring, variable rate applications, field mapping, soil monitoring, crop scouting, precision irrigation, livestock management, and others are prevalent application types in this market. Yield monitoring applications of IoT in agriculture currently is leading the market, followed by the precision irrigation application, while the highest growth is expected in the revenue generated by crop scouting application of the IoT technologies in agriculture. Proper integration of the system components and software of the whole IoT system is necessary to ensure efficient and effective agricultural operations. These cover all the major aspects from tracking & positioning systems (GPS devices, Radio Frequency Identification (RFID), monitoring & detection systems (sensors, UAVs/ drones, autonomous vehicles & tractors), telematics systems (network communication technologies & standards & protocols), and cloud computing devices. The contribution of monitoring and detection systems in the overall IoT in agriculture market is mostly attributable to the popularity of the components used in this system such as UAVs/ drones, sensors, Ag robots, and autonomous vehicles. Another component in IoT in agriculture market i.e. telematics devices, is expected to grow at the highest CAGR from 2016 to 2022 owing to the growing necessity of adopting standards and protocols and other network & communication technologies. The major dynamic trends of IoT in agriculture varies with the geographical regions. The IoT in agriculture market holds a prominent share in various countries of North America, Europe, Asia-Pacific (APAC), and Rest of the World (R.O.W.). The market is dominated by North America due to increasing per capita income, and increased mechanization in the country. The U.S. has built a reputation for adopting technologies at a fast pace, thus, is one of the leading countries holding a major share in the IoT in agriculture market. Asia-Pacific (APAC) is second in this regard after North America and is expected to grow at the highest rate from 2016 to 2022 due to the growing population and rapid urbanization in most of the major countries of APAC. The competitive landscape for the IoT in agriculture market demonstrates an inclination towards companies adopting strategies such as partnerships & collaborations, and business expansions, among others. Ag Leader Technology, Trimble Navigation, Ag Junction, SST Software, and John Deere & Co. were the most prominent names that surfaced in 2016 in this regard. These companies underwent a range of mergers & acquisitions and entered into various partnerships & collaborations. Adoption of this technology requires coordination between different members of the value chain. No one member can serve all the purposes of the market, hence there has to be proper inter-connection between each domain. The increasing emphasis on food security and ICT in agriculture will generate a huge market for IoT in agriculture in the future. The rising demand in developing countries and expansion of the smartphone technologies are foreseen as viable opportunities for this market.